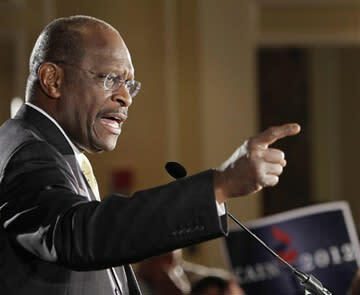 Herman Cain is reportedly considering ending his presidential bid after fielding another charge of sexual impropriety Monday. As has been the case with the past spate of sexual-harassment charges against the former Godfather's Pizza CEO, Cain has flatly denied the latest charge from Georgia businesswoman Ginger White that the two had carried on a 13-year extramarital affair. Multiple news outlets report that Cain announced to staff during a conference call Tuesday morning that he is reassessing his presidential campaign, though he noted this is not the first time he has reassessed his 2012 plans. "Now with this latest one we have to do an assessment as to whether or not this is going to create too much of a cloud in some peoples' minds as to whether or not they should support us going forward," Cain said, according to the Des Moines Register, in reference to White's claim. Cain reconfirmed that he regarded White as a friend and did assist her financially, but denied her claims of an affair. "If a decision is made, different than we should plow ahead, you all will be the first to know," Cain said. He reportedly added that his campaign will arrive at a decision in the coming days. Holly Bailey contributed to this story.